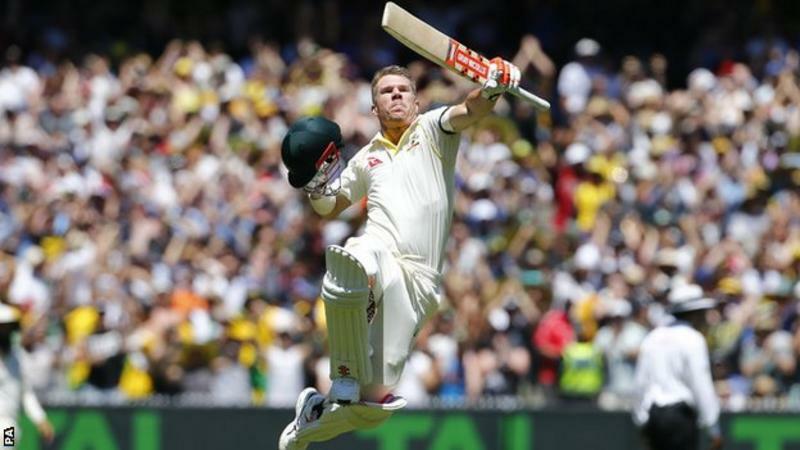 Australia’s David Warner who is known for his stylish and Aggresive left hand batting smashed 21st Test Century today on the Boxing Day Test in the fourth Ashes Test Match. David Warner Scored his century in just 130 balls with 13 fours and a Six. David Warner has been one of the most trusted and a pillar of Australian Cricket Team. His ability to change the game in one single season is not hidden from anyone. David Warner also features in the Test XI of the year 2017. David Warner surpassed India’s Virat Kohli‘s total of 20 centuries in test and in now in the list of top-10 players with most hundreds for Australia. He also became the 14th Australian to complete 6,000 runs in the longest format. David Warner had a luck on his side too when he got saved by a no ball while batting at 99. But soon after that on the very next ball he got to his triple figure. At the drinks break followed the over, Warner was then involved in a heated war of words with Curran and Jonny Bairstow as tensions frayed. Although he couldn’t make the most of it as he got out at 103 by James Anderson. David Warner’s average in Melbourne Cricket Ground is 46 and this is his second consecutive Test Century at MCG. At the end of today’s game Australia is heading towards a huge total to put England on it’s knees. Hardik Pandays all round performance led mumbai indians to crush the super kings by 37 runs . BCB initiates new domestic T20 tournament for local cricketers.